On February 27th, 2017, a 30-minute video was released by the Islamic State. In it, fighters from China’s Uyghur minority vow to return to China to “shed blood like rivers.” This, according to experts, was the first threat made against Chinese targets by the Islamic State. The video is similar to previous ones where fighters from other Asian nations such as Indonesia, Malaysia, and the Philippines, are featured telling the citizens of their countries of origin to join the Jihad by fighting in Iraq or Syria, or even perpetrating attacks at home. While the videos are proof that citizens of Asian nations have gone off to Iraq and Syria to fight, they also serve to ask ourselves the questions: What happens if/when these fighters return home? And is ISIS capable of conducting attacks in China. To better understand the threat that ISIS or returning fighters may pose to China, one must first consider the current security landscape in Xinjiang region of China, and the plight of the Uyghur minority. Xinjiang, or officially the Xinjiang Uyghur Autonomous Region, is in Northwest China, and is the largest administrative division. The region borders Mongolia, Russia, Kazakhstan, Kyrgyzstan, Tajikistan, Afghanistan, Pakistan, and India, with much of its borders mountainous. Economically, the region is important for China due to large deposits of oil and mineral reserves, in addition to being China’s largest gas-producing region. The region is home to a variety of ethnic groups, with the majority (45%) being Uyghur, 40% Han Chinese, and the rest a mixture of various ethnicities. The Uyghurs primarily practice Islam, something that has been made harder to do by the government in Beijing who do not identify with a religion. With its varied ethnic groups, and the actions of the central government, Xinjiang has been the location of ethnic tensions. Separatist groups within the region refer to the region as ‘East Turkestan’, and view their land as not being part of China, but instead as being under Chinese occupation. The separatist movement is led by the East Turkestan Independence Movement (ETIM), a group primarily made by Uyghur Muslims. The Uyghur view themselves as primarily Turkic, and are different to the Han Chinese in both linguistic and cultural terms. Since 1996, China has been battling this separatist movement, ensuring that they keep a firm grip on the region. ETIM is also allied with other Islamic groups in Central Asia, which has helped and influence the way they have operated. The actions of separatist movements have been more motivated due to activities taken by the Chinese government, particularly in recent years. In June of 2016, during the month of Ramadan, Chinese officials restricted civil servants, students, and children in Xinjiang from fasting. This is not the first time the Chinese government has done so. The government had also ordered some restaurants to remain open, to ensure that those not taking part in Ramadan have normal access. These types of restrictions are what cause human rights groups to counter the rhetoric from Chinese officials that clashes between the Uyghurs and security forces are promoted by separatists looking to gain independence for the resource rich Xinjiang region. Human rights groups on the other hand say that the actions of the government in Beijing, restricting customs and culture of Uyghurs and other Muslim and non-Muslim minorities, to be the reason for these violent clashes. In October of 2016, the Chinese government sent more than 350 officials to Hotan in Xinjiang for a three-year mission to monitor mosques. The government officials will monitor religious activities in the region, as strict rules have been implemented forbidding any person under the age of 18 from following a religion. Any person not adhering to these rules, by either studying the Quran or fasting during Ramadan, could face fines. This policy is said to be put in place to combat religious extremism, although Uyghur activists say it is a violation of the UN Universal Declaration of Human Rights. In November 2016, the Chinese government began confiscating the passports of Xinjiang residents. The human rights community described this move as a violation of movement, while the Chinese government responded that it was a necessary move to combat terrorism. These actions have only reinforced the notion that the Uyghurs have been repressed in Xinjiang, and that violence may be the result of such policies. In regards to the Uyghurs past and current combat experience, under the umbrella of ETIM, Uyghur fighters have fought in Afghanistan against NATO troops, with Al-Qaeda and the Taliban. They have also fought alongside the Pakistani Taliban, and have been battle-hardened during fighting in Chechnya and through terrorist activities in Kyrgyzstan. More recently, Uyghur fighters have been in Syria and Iraq, fighting alongside the Islamic State as well as Al-Nusra, the Al Qaeda affiliate in Syria. According to a report from 2016, it is believed that there are a few thousand Uyghur fighters in Syria fighting for various groups. It is said that many moved with their families, and have encouraged others to follow. The number of fighters having gone abroad to fight with various Islamic groups, whether in Central Asia or in the Middle East, is thought to be because of the restrictive policies and tight security measures that China has placed on the Uyghurs in Xinjiang. 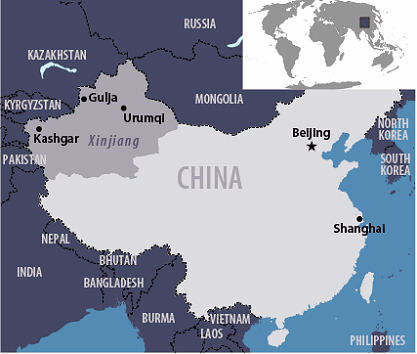 Attacks have not only been perpetrated outside of China, but several incidents have taken place in Xinjiang region. On December 28th 2016, terrorists attacked a Communist Party office in Karakax county, by driving up to it and detonating an improvised explosive device in front of the building. The attack killed one person and injured three, however, all assailants were shot by security forces. A little over a week later, on January 8th, 2017, Chinese police shot and killed three suspected terrorists in Hotan, after they were said to have resisted arrest. They had been in possession of knives and had managed to detonate an improvised explosive device. The three suspects were reported to have been part of an attack that had taken place in Pishan county two years prior. The most recent attack came on February 14th, 2017, when three assailants wielding knives killed five people in Pishan county. Within a minute of the attack starting, security forces were on the scene, and shot and killed the three assailants, bringing the death toll on the day to eight. On the same day, it was reported that six people, including two Uyghurs, had been arrested for having shared information about the attack and response over mobile phones, this, an example of the lengths the Chinese government will go to ensure news of unrest in Xinjiang province does not come to light. The spokesman for the exiled World Uyghur Congress expressed concern that the attack would provide China with an additional excuse to continue its repression of the Uyghurs using inspections and detentions. Three days after the February 14th attack, the local government of Hotan prefecture, which has seen ethnic tension between its Uyghur and Han population, held a parade where thousands of armed security personnel marched through the streets. The parade was a display of strength and used to intimidate those in the region that may consider committing crimes against the government. A day after, a mass anti-terror rally was held by security forces in the regional capital of Urumqi. This parade of soldiers, police, and armored vehicles was another show of force, demonstrating the overwhelming presence of security personnel in the region. On February 27th, Urumqi was the stage for another mass rally. More than 10,000 troops assembled for another show of force, accompanied by tanks, military vehicles, and helicopters. Soldiers from the rally were later sent to other cities: Hotan, Kashgar, and Aksu, to stage similar shows of force. In between these physical shows of power, the government has also passed new orders onto the residents of the region to combat ‘terrorism’. On February 21st, all drivers in the Bayingol Mongolian Autonomous Prefecture were told they had to install a Chinese made satellite navigation system. A member of the government said that the system was necessary to prevent theft, but also to maintain stability. These vague reasons for the installation of the GPS system, have been interpreted by others to mean that the government could now track all cars within the region regarding their every movement, particularly minority groups who are suspected of being related to terrorist activities. Additionally, in February, China created an ‘anti-terror fund’ worth 100 million yuan, and it was reported that the government of the city of Hotan in Xinjiang will now offer 5 million yuan ($730,000) reward to any person who exposes terrorist plots, or who kill, wound, or subdue ‘rioters’, a term commonly used in Chinese media to describe those who perpetrate attacks. The reward amount will depend on the information provided, with information on potential attacks on crowded places and government buildings getting a bigger reward than information regarding the acquisition of weapons. Smaller rewards will also be provided on reporting about women wearing burqas and men growing their beards. These repressive tactics will only fuel the desire for the Uyghurs and other marginalized groups to combat what they see as an encroachment on the part of the government on their land and their way of life. The exporting of Chinese militants, to groups related to ISIS and Al-Qaeda raises the fear that some of these fighters may come back to mainland China and commit attacks. This has pushed the Chinese government to seek a stronger role in the fight against global terrorism. And this fear is not unfounded. Beijing continues to be concerned that Uyghurs are using the tribal lands in northwest Pakistan to create unrest in western China. Additionally, it has been reported that China has kept quiet the involvement of some Pakistani students studying in Xinjiang in some of the attacks that took place in the region. They have quietly deported some students back to Pakistan, and have told universities to be more careful on who they admit from Pakistan. In 2016, China launched a security alliance with Afghanistan, Pakistan and Tajikistan to counter terrorism and share intelligence. This alliance is a reaction to the concern that China has regarding potential threats to its homeland. Afghanistan, Pakistan, and Tajikistan are three countries where there have been reports of Uyghurs fighting alongside the Taliban, and an alliance with these countries helps China yield power to change that. Additionally, there have been reports about Chinese patrols taking place in the border regions of Afghanistan, but these reports have been denied by the Chinese government. All that has been said is that there have been occasions where joint patrols have been undertaken by law enforcement from both sides. The patrols show an increased role by China in Afghanistan to combat terrorism. These patrols are a sign of China’s growing role as a global military power but are also for their own benefit, to ensure that terrorism does not cross the border into China. While ISIS has made a video with Uyghur fighters threatening attacks on the Chinese mainland, the likelihood of an attack remains low, but cammpt be ruled out. There have been reports from Indonesia and Malaysia of arrests of nationals returning home from time spent in Syria, or being deported from Turkey for having attempted to joining ISIS. There have also been reports of foiled plots by some nationals allegedly part of ISIS. Additionally, ISIS has contacted local terrorist groups in the Philippines to establish a caliphate on the southern island of Mindanao. The activity related to ISIS in South East Asia is significant enough to believe that lone wolf attacks or small cells could perpetrate attacks in the region including China, under the banner of ISIS. Additionally, the continued lawlessness in the tribal lands in Northern Afghanistan and Pakistan provide cover for Uyghur fighters who have fought there before to prepare and launch attacks within the Xinjiang region. In the meantime, China will continue to be proactive against the threats they perceive from Xinjiang and surrounding countries. Under the guise of ‘counter-terrorism’, they will continue to enact policies that discriminate against Uyghurs and other minorities in the region. This will most likely lead to continued attacks from these repressed minorities and could be used as a recruitment tool by groups such as ISIS or more locally with ETIM.